Two Saturdays ago, we were just beginning a brief vacation in Italy, in Sorrento on the Bay of Naples. On Sunday, as a day trip, we took a local bus along the winding, narrow, cliff-hanging road that edges the gorgeous Amalfi Coast. We rode it all the way to Amalfi itself– an important city back around the first millennium A.D., but now just a very pretty coastal resort selling hand-painted ceramics and products made from lemons. The little strip of grey pebbles and fist-sized rocks that is Amalfi’s “beach” did not impress us, but the sparkling blue, clear-to-the-bottom water was very inviting. There is one main street, which runs straight back from the sea and up into the surrounding hills about a half mile. On either side above it, houses and small lemon groves cling to steep slopes, connected by an extensive web of covered and open alleyways and steps. The duomo or cathedral is the town’s major site. It was constructed and re-constructed from the 9th to 19th centuries and displays a mix of Norman-Arab Romanesque, Gothic, Byzantine, and Baroque architecture styles. The photos above are of its Cloister of Paradise, built in 1268 as a gravesite for local wealthy merchants. The Arab style of the beautiful simple arches is not surprising, given Amalfi’s close ties during the Middle Ages with Arab traders throughout the Mediterranean (not excluding traffickers in European slaves). Pretty as the cloister was, however, I have to say that my favorite Amalfi garden was this tiny terrace (below). Its horizontally espaliered lemon trees were guarded by a Roman soldier and the seven dwarves. The Sorrentines have gone out of their way to create a completely safe and relaxed place for tourists to spend money. . . . Spritzed by lemon and olive groves, this gateway to the Amalfi Coast has an unspoiled old quarter, a lively main shopping street, [and] a spectacular cliffside setting. 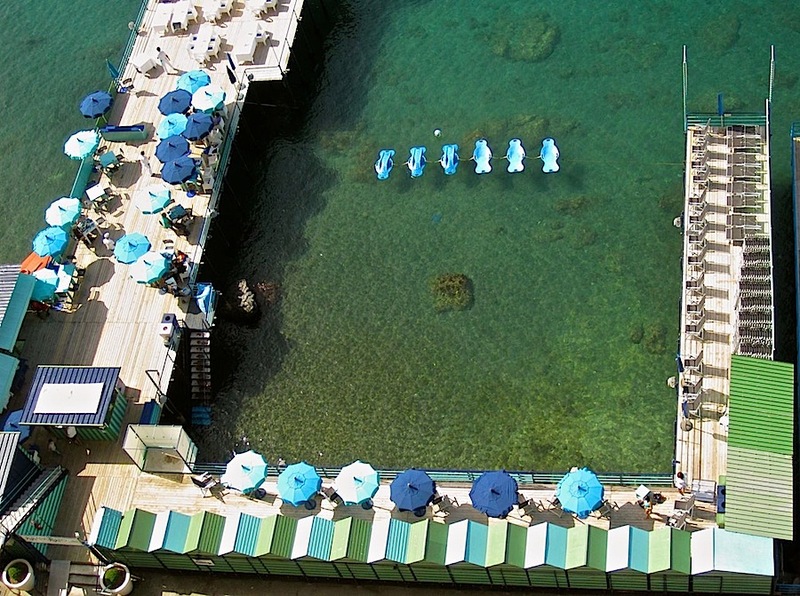 A swimming area along the Sorrento waterfront. To get to Sorrento from the Naples train station (Stazione Centrale), follow the signs leading downstairs to the platform for the Circumvesuviana commuter train. Tickets are only €4.10 and can be purchased right at the turnstile. Make sure you get on a train marked “Sorrento.” They leave every half hour. The Circumvesuviana was the only place where we had any problem with crime during our trip. The platform was very crowded, and almost as soon as we entered the train, a pickpocket tried to take my husband’s wallet. After that, he kept his credit card and money in a small zippered bag with a loop attached to his belt — something like this. We were each traveling with a rolling carry-on bag and a “personal item.” This is the most I would ever try to keep track of on this train. From the Sorrento train station, it’s an easy walk to the historic part of the city. To buy the €15 ticket, go to the sunken semi-circle area in the photo below, consult the extensive, yet unrevealing signage to the find the correct line, and then ask for a one-way on the “Jet” to Calata Beverello-Naples (a brief walk away from the Piazza Plebiscito). The view of Naples as you arrive by water is lovely. That’s Mt. Vesuvius in the center. The SITA bus that took us to Amalfi and back was a bargain thrill ride (the road is often only one and a half lanes wide) at €6.80 for all-day, on-and-off access. Buses leave Sorrento, Positano, and Amalfi about every hour (but not 24 hours, so check the schedule for the time of the last bus). 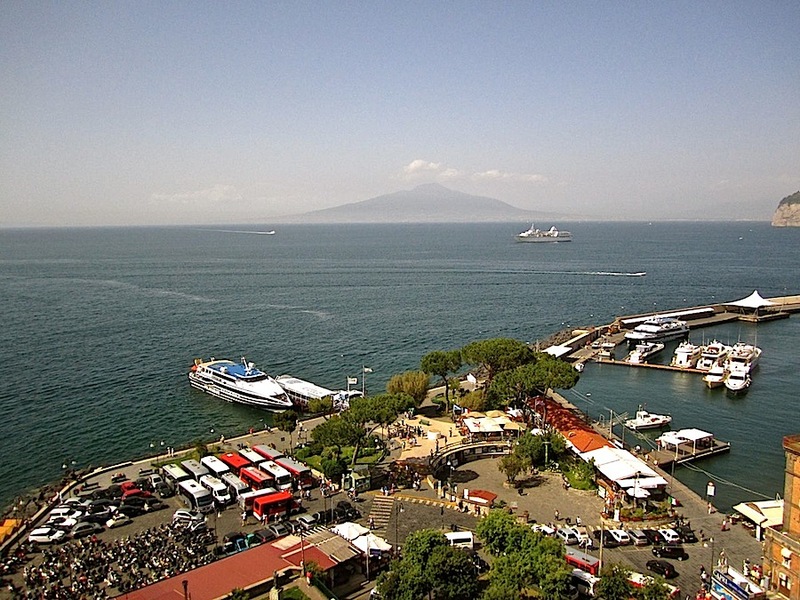 The Sorrento-Amalfi trip takes one to two hours, depending on traffic. In Sorrento, tickets are sold at the SITA bus stop in front of the train station. The buses are blue, except when they’re red. We stayed at the Hotel Rivoli in Sorrento, right in the center of the historic area. The rooms were simple, clean, and comfortable. The staff were very helpful with directions and advice. The €5 breakfast offered croissants, cereal, and fruit, plus enough sweets to fill out a respectable Christmas buffet table. We arrived in Sorrento after 24 hours of travel and by 6:15 p.m., we were exhausted. At that very un-Italian dinner hour, L’Antica Trattoria served us their three-course “light lunch” very graciously. Given the high quality of the food, it was a bargain at €20 each. We also had a very good meal the next night at the more unassuming Ristorante O’ Murzill’ at Via Dell’ Accademia, 17. The light in Italy is amazing!